Most companies get into a quagmire about what to offer and what to say to consumers with disabilities. After the research has been completed and your company understands key drivers for purchase decisions, create an efficient path for consumers to navigate to help them understand how their needs will be met, communicating with them consistently and minimizing the number of information sources consumers must touch while moving confidently toward a purchase. We’ve found the most successful brands achieve this by personalizing the route. One way to personalize this process is to have customer service staff that understands how products and services are used by people with disabilities. In most instances, people with disabilities, and families with a disabled child, live financially below their typical peers. They have to make their dollars stretch among the basics, and have medications, therapies and medical supplies that also need to be purchased. Companies that simplify the purchase process, and offer bundled packages, incentive discounts and additional value will win the market. The general rule is that a prospect has to have 7+ interactions with a company before making a purchase decision. Seven! That means that companies have to develop an integrated strategy with multiple touch points with consistency to make an impact. There can no longer be limited discussion about reaching people with disabilities in July (anniversary of the Americans with Disabilities Act) or October (National Disability Employment Awareness Month). It must consistently happen, with resources, all year long. To learn more about how your organization can penetrate the disability market, contact info@disability-marketing.com. 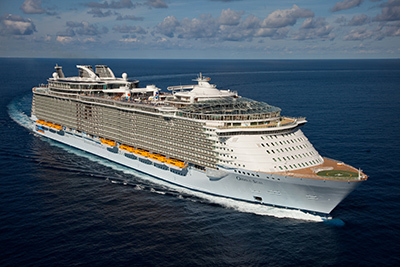 Royal Caribbean’s Oasis of the Seas, it’s largest ship, which has 46 accessible rooms. Royal Caribbean International, one of the brands of Royal Caribbean Cruises, Ltd., has recently revealed a sweeping new program to make family vacations that meet the needs of all family members, including those on the autism spectrum, a reality. The cruise line has the certification of being “Autism Friendly.” Royal Caribbean has been working toward this goal for many years, wanting to go beyond compliance with the law to truly serve passengers with disabilities of all types. The February 2014 certification was awarded by Autism on the Seas (AotS), a Connecticut–based organization that is a Developmental Disability Service Supplier to the Cruise Industry as a whole. Awarding certification status to the entire line of Royal Caribbean International ships is based on their meeting seven criteria, including training for staff, offering programs and dining area options that meet the needs of families with an autism spectrum member and more. Mike Sobbell, Founder and President of Autism on the Seas, has stated that awarding the certification to Royal Caribbean marked a “turning point” in the travel and cruise industry toward the effective accommodation of families impacted by autism. Some of the most supportive executives were Lisa Lutoff-Perlo, Executive Vice President of Operations, Royal Caribbean International, Vicki Freed, Senior Vice President of Sales, Trade Support and Service, Royal Caribbean International and Carlos Leyva, Vice President of Trade Support and Services, Royal Caribbean Cruises Ltd.
Pettit says, “We offer many elements like priority boarding, gluten free meals (and meals that are dairy free), and accommodations in the Adventure Ocean Programs.” The company’s Adventure Ocean and Teen Program caters to guests under 18 years old. There are six tiers of programming for these younger guests, with all programs being led by college-accredited counselors. The activities are offered from 9 a.m. to 2 a.m., which provides parents with a great break to enjoy their holiday. The activities are grouped by ability, and not strictly age. Examples of one of the specific program refinements, which may appeal to families, are films are presented in an environment with low lighting and volume. Guests are also able to freely talk and walk around during the films. Movies are offered on all autism group cruises and cruises when there are at least five children with a disability onboard. Pettit noted that the movie sessions were beta tested on Oasis of the Seas in 2013 and got great results. The full range of activities offered can be found at www.RoyalCaribbena.com/AutismFriendly. The dates and times of these activities will be highlighted in the Cruise Compass Program. “The young passengers with autism are not in a separate section. They are integrated into the programs we have, and our staff has been trained to provide a wonderful experience for the child, and his/her family. We have already been very successful accommodating passengers with disabilities. The Autism Friendly certification builds on our success. We recognize that a family with a child with a disability is on duty 24/7 so it is extra nice for the parents to be able to participate in activities with their child, but also be able to have a dinner by themselves. Pettit says, “Many of the things we do every day are all complimentary, with no additional charge for families and their loved ones who have disabilities. The one thing we do not have is additional staff to serve guests with autism who are over the age of 18. There are group cruises that often offer additional staff that may be right for these families to use.” Pettit says these companies who offer group cruises with extra staff often work with the cruise line (see below). Royal Caribbean is one of the first cruise lines to offer training for travel agents. “Over eighty percent of our cruises are booked with travel agents and we tell our agents about the accessible options through a series of webinars called the University of WOW including a course on their autism-friendly program in their on-line training program/.. We developed this program and are making an effort to communicate to the public to let them know that this option is here. We already are doing many of the things that the certification required and so we wanted to get recognition for our efforts,” says Pettit. “I just want to thank you for your efforts to become an expert in dealing with autistic children. My wife and I have adopted several children with special needs, most on the Autism spectrum and this is truly an amazing thing. Thank you so much for this as a dad.” – James D.
For more information about the program, prospective guests can contact Royal Caribbean’s Access Department at (866) 592-7225 or send an e-mail to special_needs@rccl.com. Learn more about Royal Caribbean’s committment to accessibility at www.RoyalCaribbean.com/AccessibleSeas. The disability market is the largest untapped group of consumers in the United States, comprised of 56 million people and represents an annual disposable income of $544 billion. The disability market is more than twice as large as the tween market (20 million), and has almost 3 times the disposable spending power ($180 billion). The facts alone are not enough. Many companies know they should do more to reach the disability marketing, but few take decisive action. Successful companies know that in order to reach consumers with disabilities and their influencers, it’s important to understand what drives them. What are their needs? How to communicate in ways that resonate with them? And, how can a company build a relationship that inspires the know/like/trust factor? Most people with disabilities receive and trust information on products and services from peers, conferences and disability organizations. The power of an endorsement coming from a trusted source is strong. If your company has built relationships with disability organizations, begin to identify the one/s that have programs or services that align with your company’s mission and explore opportunities to attend events, or add value at their conferences with workshops that enhance the lives of the people they serve. Peer review of products is preferred over solely receiving advertisements from a company. Word of mouth for the market is THE most trusted way to reach them. Determine how your product/service be experienced by ‘influencers’ so they can share their experience with their peers? Consumers want companies to demonstrate a meaningful commitment to the disability community by employing people, strengthening the buying experience, and placing products and information in an easy-to-find format. How can your company tell its story so it resonates with consumers? This goes a long way to build credibility. People with disabilities want to be able to interact with the product or service before making a purchase. As your team plans its 2015 outreach calendar, what disability events can be integrated into the schedule so consumers can see and touch your products? When possible, promote products and services in a staggered manner – regionally, statewide and nationally. The SMG Team has found that repeated, consistent resonant messaging that is focused in approach allows consumers to understand corporate commitment to them, and lays a solid foundation for building trust. This approach provides companies with the ability to test and refine messaging and tactics, creating a win-win. If you’d like to learn more about how to understand the disability market, contact the SMG Team for a 30-minute free call to gain further insights.